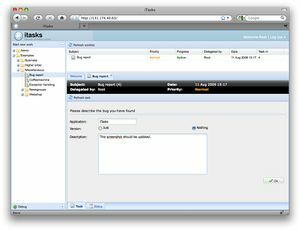 The iTask system (iTasks) is a task-oriented programming toolkit for programming workflow support applications in Clean. With this toolkit, interactive systems can be specified using combinators in a very high level declarative monadic style. Programs are constructed by combining typed 'tasks'. These tasks produce results that can be passed as parameters to other tasks. Tasks are constructed by combining single steps sequentially or in parallel. From iTask specifications, executable web-based workflow support systems are generated automatically. A highly declarative API for specification of interactive systems as task compositions. Automatic generation of web-based user interfaces for entering and updating and viewing data. Automatic instant synchronization between different clients using html5 push technologies. Download and unzip a Clean Development Release. It contains iTasks by default. Clean 2.4 is not supported in combination with iTasks. Mac and Linux users should follow the installation instructions provided in the README.txt. You can find up-to-date documentation via the Cloogle search engine which indexes all standard libraries, external libraries, compiler errors, ABC instructions, builtins and syntax elements. Documentation of the concepts of iTasks is still mostly done in scientific papers (look for iTasks on the Publications page). The iTask system works with most modern browsers. IE 9 is a known exception, we are working on that. Find out what your current ip address and use that instead of http://localhost/. Better: use http://127.0.0.1/ instead of http://localhost/. best: change the settings of Firefox. toggle the value of this parameter to True. This page was last edited 12:12, 5 July 2018 by Clean user . Based on work by Clean users , , and .